Put the chicken with all the ingredients in the first batch into a pan. Add half a cup of water and simmer gently until the chicken is cooked and the rest of the ingredients (lentils/potatoes/onion) are all soft. Increase the heat and dry off any excess moisture.
. Allow this mixture to cool completely. Then grind the mixture until smooth. Turn it out into a bowl and add the channa flour and HALF of the beaten egg. Add the garam masala, lemon juice and chopped coriander. Give everything a good mix. If the mixture feels dry, you can slowly add the rest of the egg one teaspoon at a time and mix. If it feels too sticky, add 1-2 tbsp of a breadcrumbs and mix. At this point you can refrigerate or even freeze the mixture until needed. 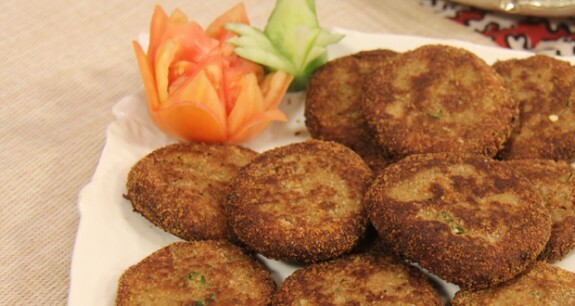 When ready to fry, shape the kababs into flat discs and deep fry them until golden brown on both sides. You can dip them in egg before frying if you want, but I prefer my shamis to have a nice crispy coating so I never dip them in egg. Serve with onion and lemon slices. Enjoy! !